By helping students develop an intuitive understanding of the subject, Fundamentals of Microelectronics teaches them to think like engineers. 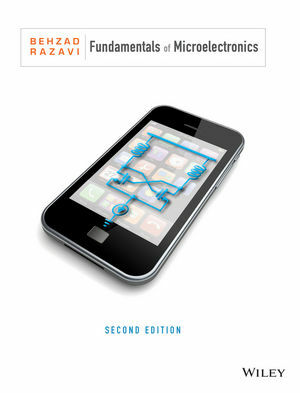 The second edition of Razavi’s Fundamentals of Microelectronics retains its hallmark emphasis on analysis by inspection and building students’ design intuition. It incorporates a host of new pedagogical features that make the book easy to teach and learn from, including application sidebars; self-check problems with answers; simulation problems with SPICE and MULTISIM; and an expanded problem set that is organized by degree of difficulty and clearly associated with specific chapter sections. More real-world application examples for key concepts. More computational problems as well as the symbolic problems that are a Razavi hallmark. New application sidebars that show practical examples of theory in action. New self-check practice problems with answers provided. New simulation problems using PSPICE and MULTISIM. A clearer separation of problems by chapter section, with several basic, moderate and challenging problems in each section. Challenges students to develop the skills of analysis and synthesis in problem-solving. Utilizes an analysis by inspection approach in which students learn to ‘read’ complex circuits as variations and combinations of simpler typologies. By mapping complex circuits to their simpler constituents, students can more efficiently analyze circuit behavior than if they attempted to force the application of the equations they learned in their circuits course. Provides numerous problems that require symbolic, rather than numeric solutions, so that students are forced to address problems conceptually, rather than as an exercise in calculation.